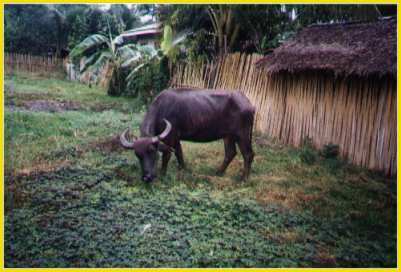 With the help of our members and sympathizers I would like to purchase a few carabaos thus saving them from a certain death via the slaughterhouse and give them a safe, permanent retreat. This project will bring a level of sensitivity to the public opinion showing that a loyal servant will not be thrown out like an old sock. 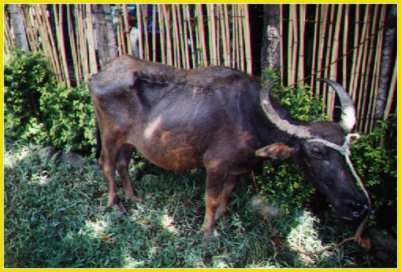 The animals ready to be slaughtered shall be examined and meticulously selected on a case by case basis in order to reach a maximum impact. 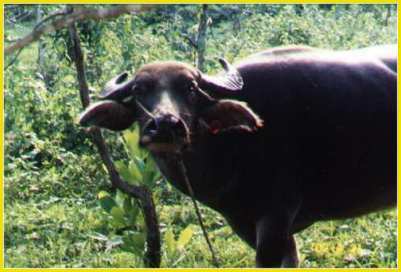 Obviously, we cannot hope to save all carabaos destined to their sad terminal fate in Manila, but each rescued animal will be a small victory for our cause. 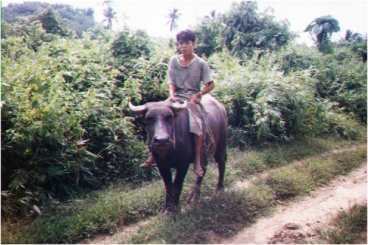 To accomplish this task, I seek to purchase the documents from the carabao owner in a timely manner. 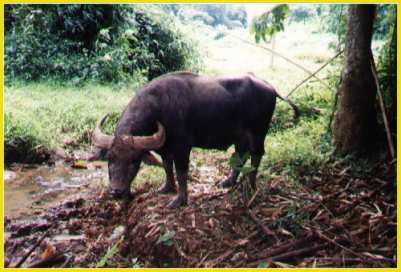 The carabao will then remain with its present owner who shall continue to provide for its welfare and enjoy its services. 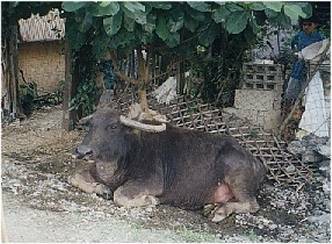 Said carabao shall be identified and a contract between the owner and the foundation will be executed, preventing, amongst others, a second sale of the same animal. 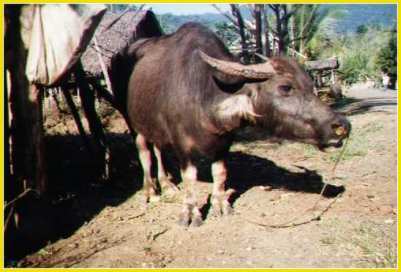 The animals which can no longer be maintained by the farmer shall be retired in a sanctuary in the south of the province where the cost of the land is around 2 to 3 pesos per square meter, or entrusted to another adopter with all the warrantees. 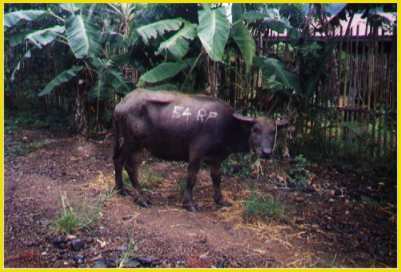 The maintenance fee of those animals is minimal : humid land consisting of a pasture and a shepherd whose daily salary shall not exceed 170 pesos ($3 US). The success of this project shall be equal to the interest you give it. If you wish to participate in this rescue action, all donations shall be welcome. You may send Euro to our Belgian Account Number 000-1437964-36. Dollars are accepted at our Philippine Account Number 2474-01122-7, send a Check from a US financial institution at our following address: PO Box 362, Puerto Princesa City, 5300 Palawan, Philippines. 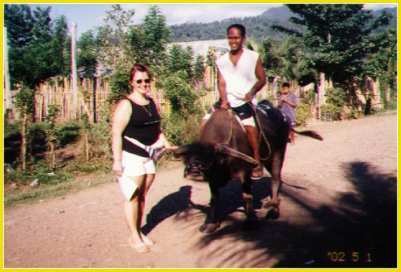 Each 200 EUR/USD collected with the mention "carabao" shall be dedicated to the purchase of one carabao. It is a great delight that we introduce our 10 first protecteds. Association well known for their battle for abolition of vivisection and prevention of martyrdom of laboratory animals (APMA). The granddaughter of the vendor adopted Magda. 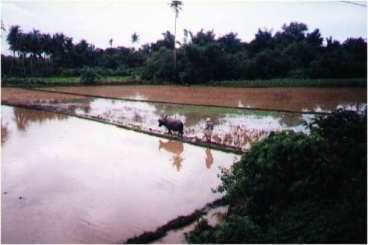 Cléopâtre cultivates principally rice but also vegetables. 4. Duchess, 12-year-old female. 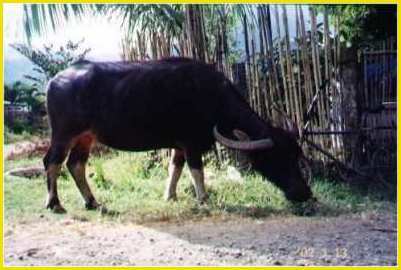 Several donations enabled us to buy this carabao that was adopted by her vendor. Seeing her young age, we asked the adopter of Cléopâtre to adopt Caprice. A young farmer, delighted by the opportunity, adopted her the same day. 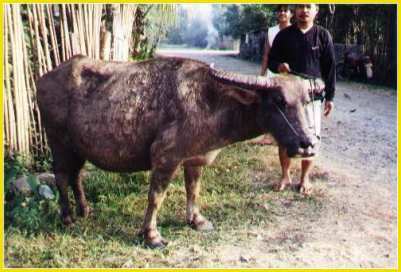 She is pampered and coddled and put on 50 kg despite of the ploughing season. 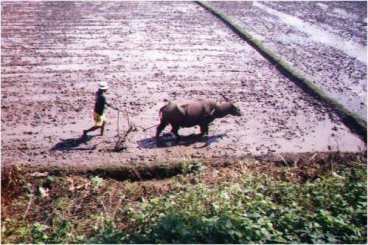 She cultivates rice and vegetables. offer a rock bottom price. with a companion in adversity. 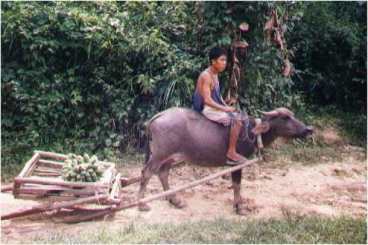 Adopted by a delighted young farmer, Emily came at just at the right moment for the rice field-ploughing season. 9. 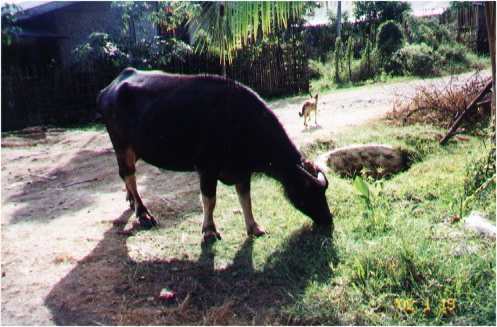 Salin, 14-year-old female. She was with Emily. price of Salin into the foundation. sleigh. 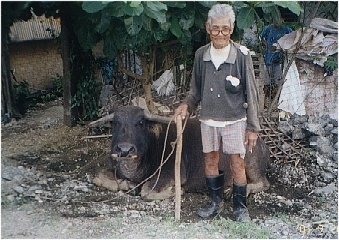 Our member Georges shall adopt another carabao later. 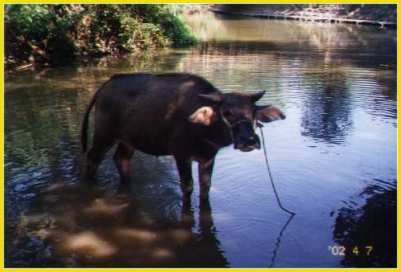 he accepted a price lower than he would have obtained from the slaughterhouse. The man seemed to be content of such a human solution. After having had the animal castrated, we entrusted him to a young farmer where aggressive tensions were changed into useful work.